Calvin R. Stapert is professor emeritus of music at Calvin College (Grand Rapids, Michigan), where he taught for 38 years. 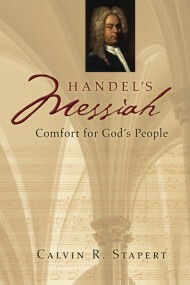 His latest book is Handel’s Messiah: Comfort for God’s People (Eerdmans, 2010). I have to begin with a confession. Growing up, I didn’t listen to Handel’s Messiah (though of course, like virtually everyone, I heard the Hallelujah chorus). But I was more likely to listen to Elvis Presley’s Christmas album than the great 18th century oratorio! For those who have never listened to the whole thing, why should they do so? Messiah is much more than a series of arias with comforting Bible texts mixed in with some celebratory choruses. It is the dramatic story of Salvation—God’s rescue of His people from the clutches of Satan, sin, and death. Though separate favorites can be very moving and meaningful by themselves, they can all too easily be made to mean anything (or nothing) at all. The prime example, of course, is the Hallelujah chorus. When sung in Macy’s it might be anything from just another celebratory piece of music (like the Triumphal March from Verdi’s Aida, which the organist played before breaking into Hallelujah) to something vaguely “spiritual” with Christmas associations to a coronation anthem for the King of Kings who is the Lamb of God who bore the iniquity of us all. Hearing the Hallelujah chorus, or any of the other favorites, within the context of the whole story, makes them all the more meaningful. Can you give us a thumbnail sketch of who George Handel was? George Frideric Handel was born in 1685 in Halle, Germany. Like J. S. Bach, born the same year, Handel was born into a Lutheran family and his earliest musical training came from a Lutheran organist and church musician. But unlike Bach, his career went in the direction of opera. From age 25 when he moved to London, his primary occupation was composing and conducting Italian operas. When the popularity of Italian operas in England waned in the early 1730s, he turned to English oratorio—or, more accurately, he “invented” English oratorio, a genre that grew up in Italy during the 17th century but did not yet exist in England. Though he was reluctant to give up opera, during the ’30s he gradually turned to oratorio. After composing Messiah (his sixth oratorio) in 1741, he left opera entirely and went on to compose about a dozen more, leaving an unmatched legacy in that genre. You write that apologetics was one of the reasons that Handel wrote Messiah. Can you explain? How will reading your book enable people to understand the music and the theology of Messiah better? I had two overarching purposes in writing the book. The first, which doesn’t directly answer your question, was to show an example of how “God moves in a mysterious way, His wonders to perform.” The Messiah, a work of art that has told the Gospel story to more hearers than any other, owes its existence to a remarkable series of historical twists and turns that finally led to its composition. To make a long story short—without connecting the dots between beginning and ending—Messiah, an oratorio (a genre that originated in a devotional movement in the 16th century in Counterreformation Italy) was composed by an 18th-century German Lutheran who was happily established in a career of writing Italian opera in England, a country in which oratorio did not exist until he “invented” it. The second purpose, which does speak directly to your question, was to write a commentary on the whole oratorio. I explain some basic features of Handel’s musical “language” to help listeners understand (or understand more fully) how the music relates to the text. Sometimes that’s obvious (e.g., “The Trumpet Shall Sound”), sometimes it’s bewildering (e.g., “All We Like Sheep”), but even when it’s obvious there is usually more than appears on the surface. Sometimes, too, the text needs explanation. Is “Lift Up Your Heads” about the Resurrection or the Ascension? Who are “they” in “Thou Shalt Dash Them in Pieces”? Or why isn’t “I Know That My Redeemer Lives” in the Resurrection part? Above all I want to help listeners hear the work as a musical drama that tells the greatest story ever told. Although it’s not without value to hear the work as a medley of favorite Bible texts sung to beautiful music, the whole is greater than the sum of its parts. Are there any particular recordings of Messiah that you would especially recommend? I also like the performances directed by William Christie, John Eliot Gardiner, Christopher Hogwood, and Trevor Pinnock. All these, like the Suzuki performance, are done on period instruments and with historically informed performance practices. Obviously I prefer the historically informed performances, but I realize they’re not everybody’s “cup of tea.” Most performances today on modern instruments by professional symphony orchestras and choruses are in varying degrees influenced by historical performance practices and are done with ensembles scaled down to something closer to the size typical in the composer’s own time. Many of these are very good, e.g., the performance directed by Neville Marriner. Some will still prefer the performances with huge choirs and 19th-century orchestrations. The recording by Sir Thomas Beecham is a particularly famous one. Although I grew up hearing the Beecham recording, and still have a nostalgic fondness for it, I am convinced that Handel knew exactly what he was doing and needs no modern “improvements.” But if big, romanticized performances draw people to Messiah, more power to them! For more on Messiah from Professor Stappert, in addition to the book, you can listen to this conversation he had with Albert Mohler. Tozer vs. Lewis: What’s the Most Important Thing about Us?